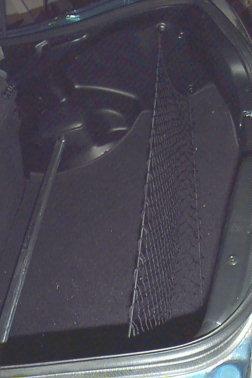 On the earlier 3rd generation Integras, the driver's side floormat has a tendency to be pushed up under the pedals, requiring constant adjustment to keep it in the correct position. 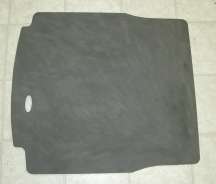 Later models corrected this with a metal peg attached to the body which holds the floormat in place using a grommetted hole in the back of the mat. 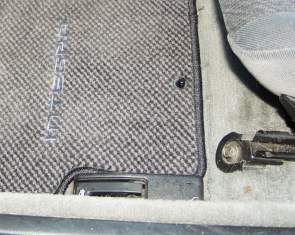 New OEM carpet mat sets however come with this peg bracket and necessary parts to install it into the earlier Integras, which already have a hole in the floor and the proper cuts in the carpet to install it. 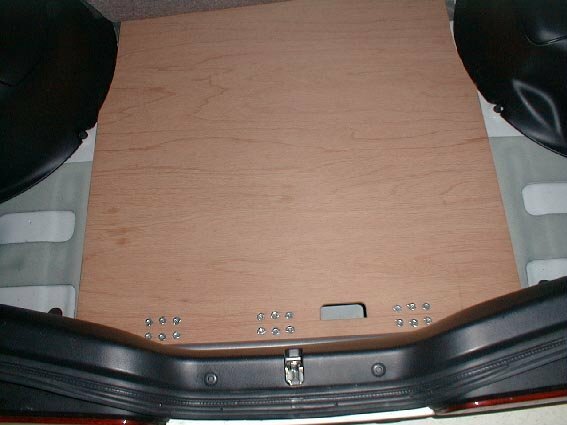 I got one of these sets since my 8-year-old carpets were looking pretty ratty, at least in the front, and also because everyone who's bought aftermarket carpets for the Integra have had very negative things to say about them. What I want to know is why Acura didn't use these pegs to begin with since they obviously planned to, as evidenced by the pre-cut hole for the bracket in my car. 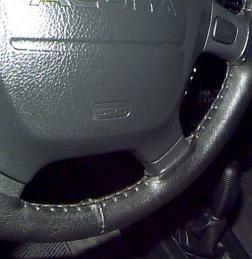 This is the genuine Acura leather steering wheel wrap. It's a real pain to install because it must be laced up tight by hand, but it's worth it for the quality feel it gives to the steering wheel. 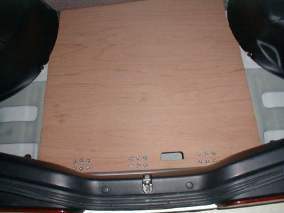 Newer Integras come with this installed from the factory. Update: After about 8 years of use, the leather steering wheel wrap really wasn't looking that great anymore. Instead of buying a brand-new replacement for $60 from Acura, I instead bought a complete steering wheel from a 2001 Integra for $50 on eBay. The factory-installed leather wrap is a little better than my own wrapping job. I also got a new airbag with it that I may try transplanting. 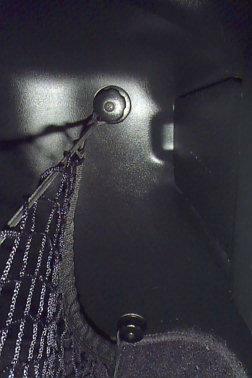 This is a cargo net that I installed in the trunk. It's made by Highland Products, and is commonly available at most auto parts stores. 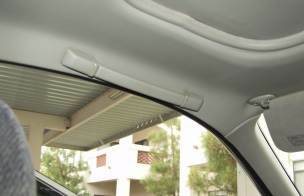 It's invaluable for keeping groceries and other small items in place during high speed cornering maneuvers. 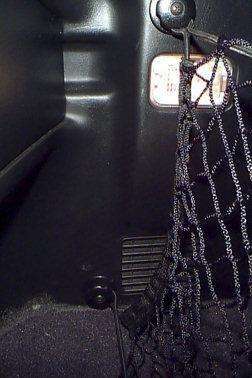 I always thought the interior looked nonsymmetrical with a grab handle only over the passenger door, and that the plastic pieces filling the holes where the driver's-side is supposed to go looked really cheap. So I bought another grab handle from a junkyard and installed it. I actually use it sometimes to pull myself up after working with my head under the dashboard. After 8 years, the cheap cardboard spare tire cover was literally falling apart, so to keep my car from looking too decrepit, I looked for a replacement. An identical cardboard piece from A&H Motorsport was a whopping $70, plus expensive oversize shipping! The Integra Type-R's plastic cover was $84. So instead of wasting all that money on a spare tire cover, I made a replacement out of a sheet of 1/4-inch thick fiberboard (or "hardboard") from the hardware store. It's like cardboard, only much more dense, so it should hold up better than the cardboard cover did. It only cost about $5 for a 4'x4' sheet. I cut it to shape with a jigsaw, sanded down the edges, then spray-painted the top with gray primer, and glued the foam blocks from the original cover to the same locations on the backside. I had a little too much time on my hands and didn't like how the regular grey grill cloth on the front door speakers didn't match the black interior, so I exchanged it for some black grill cloth from Radio Shack that I had left over from a home speaker project. The grills are easy to pop out from the front since they're held in with retaining clips, but the cloth is held onto the grills by glue, so I had to rip it off. To install new cloth, just cut out the cloth in the shape of the grill covers and glue around the edges with epoxy. 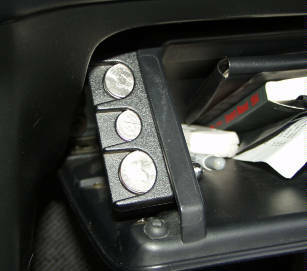 The Integra's coin tray (on the left side of the steering wheel) is rather pathetic, with no separate slots to hold different coins. So I found a rectangular-shaped 3-slot coin holder from an early 90's GM car at a junkyard and mounted it on the left side of the glove box with double-sided adhesive tape. It's normally hidden, but is easily accessible to the driver when the glove box is opened. During the summertime, I became painfully aware how much I wanted some darker tint on my windows than what came from the factory. Apparently Acura realized the greenhouse effect is a problem on this car too, since they installed a new type of solar-reflecting glass on the Integra starting in 1995, one year after I got mine. Since I had no intention of replacing all the glass on my car for this, window tinting film was the obvious solution. I previously lived in the police state of Virginia, which as many people have noticed with such laws as a radar detector ban, mandatory front license plates, and very aggressive enforcement, is a state that apparently hates cars and car lovers. The legal limits for window tinting there were rather strict: 50% VLT (Visible Light Transmission) on the front windows, 35% on the rear windows, and 28% on the rear windshield, with a plus or minus 7% tolerance. While there, I used Axius brand film from Wal-Mart in 35% VLT grade. At the 7500 quality level, it used a metallized film layer to reflect heat, and had no dye layer to turn purple over time. Using a hard rubber squeegee and window film application solution from the same company, I managed to apply film to the driver's and passenger's front and rear side windows with very good results. However, I never tinted the rear window because of the difficulty of applying it to the large compound-curvature surface. While I had the tint, however, it performed well, noticably reflecting heat, not being dark enough to attract unwanted police attention, and lasting about three years with no degradation, peeling, etc. But after living in sunny Phoenix for a while, I decided I really needed the back window tinted, and after an aborted attempt at doing it myself, I caved in and took it to a professional tint shop. They applied Llumar tint using 35% in the front windows, and 15% in the rear windows and rear windshield. Legally, the back windows and rear windshield can have any level of tint, but the front windows must be at least 35%. This tint is very dark, and enhances the car's appearance greatly while keeping the interior much cooler.